The tourist satisfaction index for domestic destinations stood at 72.6 in the first quarter, down five points from the same period last year, according to a report released by the China Tourism Academy, affiliated with the China National Tourism Administration, on Thursday. 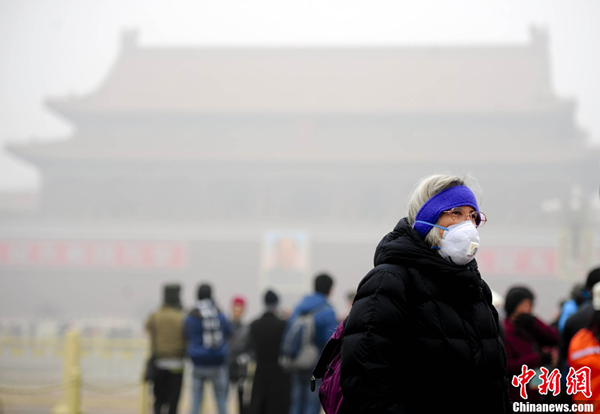 A tourist wearing a mask walks amid smog at Tian'anmen Square on Feb. 28, 2013. The score is the lowest since the academy started the quarterly tourist satisfaction survey during the second quarter of 2009. The survey is based on a questionnaire, online comments from tourists and complaints in 60 Chinese cities, with a score above 75 meaning "basically satisfactory". In the first quarter of this year, the smog in many regions affected tourists' decisions and experiences, the report said. For example, Wikitravel, a free travel guide website, listed Beijing in a watch list on Feb 25, warning tourists not to visit the city. It said Beijing remained cloaked in hazardous white pollution, hiding much of the skyline that day. Travel agencies also received a score below 70, according to the report. Agencies for hot destinations such as Harbin, Kunming and Sanya received negative comments about high prices, travel schedules and shopping spots. The tourist satisfaction index for outbound destinations received higher scores. According to the report, the Chinese outbound tourism satisfaction index in the first quarter was 78.9, or "basically satisfactory", and 21 out of 22 sample countries received scores above 75. Among them, New Zealand received the highest score of 83.4, the report said. "From the difference of the two scores, we can see that China still needs to promote the country as an international tourism destination," said Li Zhongguang, director of the Institute of Tourism Industry. Li said a more comprehensive policy from the central government is needed to develop China's tourism industry, and public opinion toward the sector should be monitored. The academy estimated that in the first quarter, the number of outbound tourists was 26.4 million, an increase of 17 percent from the same period last year. The total spending of those outbound tourists was $34 billion, a rise of 16 percent compared to the same period last year. However, the number of inbound tourists continues to drop. In the first quarter, the number was estimated at 31 million, a drop of 3 percent from last year. The report said that revenue from inbound tourism in the quarter was estimated at $11 billion, a drop of 3 percent from the same period in 2013.